If you're coming here from reddit, and you like this, let me know. Or check out the other stuff I write! There have been some posts lately on how to label adventures. I think that the old methods and indeed these new methods are unsatisfactory! I run a game based on agency and that has certain specific description requirements. Here is an example of some encounters in my adventures and how I think they should be labeled. My entry for the famous Tick room in the Moathouse. The bar is the line separator on the page. Kitchen 17) | Tables -> Stained, Wooden Cask->Giant Tick! 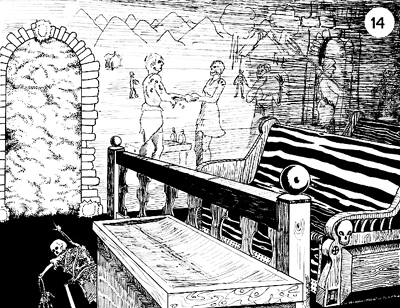 Small Alcove 32) | Refuse, Furniture, Bones->in corner, 8 Ghouls! Ornate Iron Armchair-> Dwarven, decorative cobalt inlay (900gp) 65lbs. + Bulky. Blanket (60gp) Chiffon, covering-> ottoman, Hollow slate upholstered in woven twill. (200 gp) 35lbs. + Bulky. (How I generated that treasure is here). Let's break down how this works. Before the bar on the page is the room type. This let's me know instantly what kind of room this is. When stocking this room, I use Empty Rooms which lists common contents for every room type. Ever. In the history of the world. All rooms. After the bar are the immediately visible items! When describing things, I only use the bolded words! The players receive no extra information unless they ask for it! The arrows indicate that it is either "Information available upon further examination" or "An item contained in or on the container". For items containing or supporting multiple items (tables, chests) indents are used to group the items. The order the thing is listed, is the actual order it is stacked. I.e. Inside the ottoman, the gem is on top of the mail, which is covering the pouch and scrolls. Gems are noted as to number, with size/quality following. Blanks indicate average size/quality. The GP value is for each individual gem. Coins listed without modifiers are just that, loose coins. Any word that is not important, is not used. It is clear, for example, that the horsehair cord with the platinum aiguillette is what is securing the moleskin sack, by virtue of it being listed on the same line. On the fly, I look down and say, "Roll for surprise (party rolls a 4, ghouls roll a 3) You see a small alcove filled with bones, furniture and refuse, as half a dozen dessicated humanoids turn towards you and groan. They move forward intent on consuming your immortal souls, except for you Frank. Declare actions." After the combat I will go "What do you do?" If they go, "We look around." I'll say, "You see a small alcove with refuse, furniture, and bones in the corner"
If they say, "We look at the furniture." I'll say, "You see an ornate iron armchair, a blanket covering something like a box, and a sack sitting next to the chair." "You can't tell from here." The key things here are speed, flexibility, and creativity. I do it this way, because I am in constant engagement with the players. I look down at the tick room, and I see enough information to tell me everything I need to run the encounter successfully in seven words. The next time I will have to disengage from the players is to read the Ticks stats! 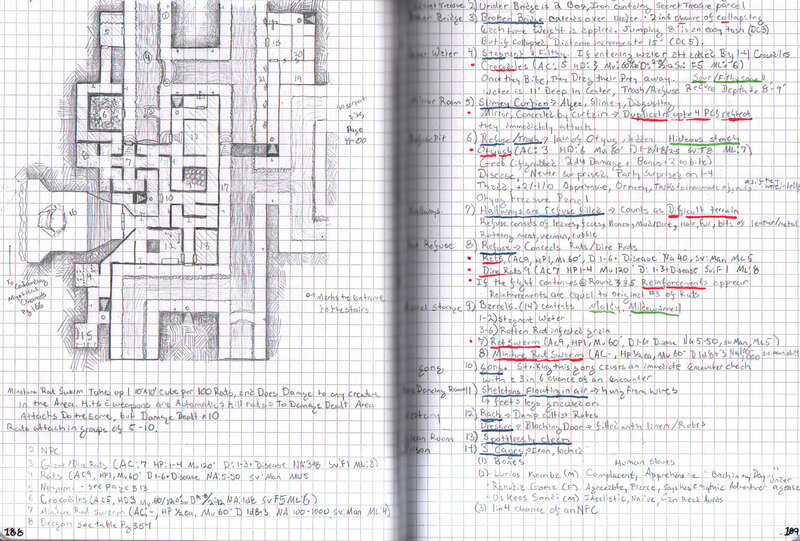 It also allows me to construct encounters dependent on player skill, in such a way that I won't give away anything by having to check the sheet. I've given them the interactable objects, with the red herrings, so they can't read where the danger is. This structure changes depending on the complexity of the room easily, while still keeping the information clear, and not taking up a ton of space on my sheets. From the player side, they don't know what the results of interacting with anything will be, so even though it seems simple from the DM's side, it remains a complicated sequence of choices for the players. Mostly it's safe to examine refuse or travel through it, except when it isn't. If they didn't examine the refuse; and it contained rot grubs; and they moved to inspect the furniture. . .
My school is all old up in here. DM:'First, the others checking the containers find that they held nothing but water, or ore totally empty, and that the wood is rotten to boot. You see a few white, eyeless fish and various stone formations in a pool of water about 4' to 6' deep and about 10' long. That's all. Do you wish to leave the place now?" Edit: There are more examples, here in the future. Here is a page from my notes. I like this alot. I am a visual guy and this definitely organizes things into a simple, logical visual style that theoretically will be very easy to use at the table. The question I have is how would you organize a really complicated room that has several things going on at the same time? For example: an alchemst lab guarded by a glyph of warding, a wizard intent on escape, guards intent on holding the line and getting help from other rooms, magic items monsters will use etc.? @FrDave, so you'd want more examples then? That's actually relatively easy. 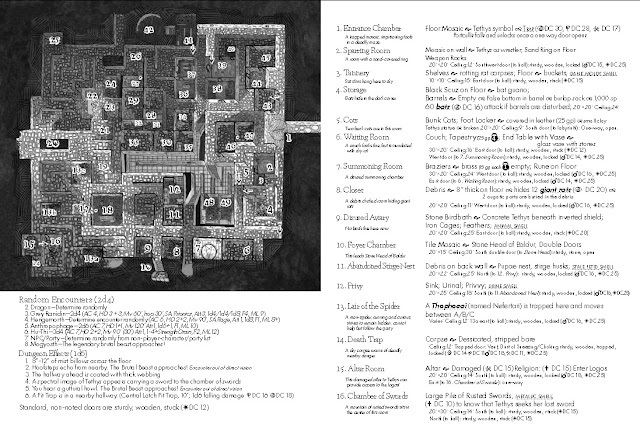 The list is organized by priority, meaning the first line is the first thing at the table described to the players. From there, it is their choice to deal with it. As I've covered in Trick, Empty Rooms, & Basic Trap Design there are basically just 5 types of encounters. Monsters, Traps, Tricks, Treasure, or Nothing. Alchemy Lab 14) Alchemy Equipment, Wizard Escaping, Guards. Then I would have a section for each, explaining the key things you would need to run the encounter. As a note, it isn't theoretically easy to run - it's the basic way I organize my notes. It is provably easy to run. Being a visual guy...yes, more examples are always good! It is provably easy to run. The reason I want to see a complex example is to see how visually simple/complex/easy to follow/confusing it is for my own use. I find that there is a certain level of visual complexity that overloads my brain. Even if there is order within the complexity, there is a point after which it becomes useless for me because no matter how hard I try, it is impossible to process the information being presented. This is why I am interested in how modules are presented. I find most very difficult to use at the table. Therefore I prefer an improvisational style to Referee a game. If I can find a method that works...then I can make modules work for me instead of just being sources of cool ideas — and why I am thrilled to have several folks talking about this very issue. If you want to give me an example of a "complex" room that you describe, I would really appreciate the opportunity to key it out for a future blog post. You can email me or post it here. Very cool. I dig this format. I'm gonna give it a whirl and see how it works for me. First, thank you; this is the most useful kind of blog post for me on the gaming web: explanations of how things are run at the table. Second, what format do you keep your notes in? Digital, handwritten notebook? Third, do you find they grow over time during things like restocking? Or do you discard them and start over for the same area if the description has changed? Tables -> Stained, Wooden Cask->Giant Tick! The arrow seems to have two different meanings (as you also noted above). The first is elaboration, the second is concealment. What about comma for elaboration, and parenthesis for hidden? This seems to match English a bit better for me (as "tables, stained" is a standard way of writing "stained tables" in a sorted list) and the parenthesis seem to visually imply something being contained. What do you think? For multi-line details, indentation could be used. One of the things I dislike most about published modules is how they mix info immediately obvious to the PCs with info that is hidden. Boxed text is a (partial, awkward) improvement, but this is much better. I’m not sure there’s a big difference. It seems like the arrow is saying “the next bit that may be revealed by closer examination”. ...would initially be described as a stained table and, upon closer inspection, the claw marks would be revealed. To me, it seems like the arrow works well for this—whether something concealed or just detail that isn’t immediately obvious—because it stands out more than other punctuation. Though somehow distinguishing things that are truly concealed might be helpful as well. In other words, one can be perceived by closer visual inspection (but no physical interaction), whereas the second can be perceived only by physical interaction (e.g., opening, breaking, etc). It seems like the two concepts are different enough to warrant different symbols (unless you attach verbs too, which would remove the ambiguity of on/in). Only, at the table, especially since I'm writing the notes for myself it completely fails to matter. I know that the demon is inside the box - the text just works as a reminder. Fair enough; I was approaching this as a format that could be used by someone who did not write the material. Also useful for my own notes, because I generally forget what I was going on about after several months. If this becomes an issue I'd think that a simple different type of arrow would make it obvious? Any further confusion should be alleviated by the fact that your wrote it, as -C stated. As the blog text wrapping seems to be messing up the layout. Is anyone else having this problem? It formats very well for me on the blog. Some of the precedence around the blanket is unclear to me, and I thought it was maybe because of the wrapping or indentation. No, that's what I have also. The weight applies to the ottoman. It just got word-wrapped around. Okay, here's a challenge. Code this. This is one location from Matt Finch's Demonspore module. A massive portcullis of wooden beams, bolted together with iron, bars the way across the tunnel and river. The unpleasant smell of rotten fish is heavy in the air. • Toad-Man Sentries (2): HD 2+1; HP 11, 5; AC 6; Atk 1 spear (1d8); Move 9 (Swim 12); Save 16; AL C; CL/XP 2/30; Special: None. The central part of the portcullis, which descends into the river, has longer bars than the rest of the gate, descending into the river itself. However, the bars do not actually extend all the way down to the riverbed, and if the party is entering (or leaving) the Halls under the river, it would be easy to squeeze underneath. Treasure: One toad-man carries a pouch containing 10gp and a small crystal worth 50gp. The second toad-man carries 22gp and a potion of healing. I'm a big fan of your formatting - thank you. I've got to say, this is hands down the most useful dungeon room format's I've come across. My hat is off to you Courtney. I am going to be using an adapted version of this in my own campaign. Has anyone done this for an entire adventure? I'm thinking of writing a summary sheet for my own adventure using this method.